Hallux valgus is your big toe pointing and bending outwards, then making a bump in the side of your foot. It is the deviation of your first metatarsal medially, and the hallux deviating laterally as well. While this is not caused by your choice of footwear, but some footwear can aggravate of this condition by compressing the toes when walking. A factor in acquiring it may be familial inheritance. You may have a distant relative having the same issues. Some are just born with the tendency to develop this deformity. Sometimes, there is no pain, and thus, it isn’t an issue. However, as tendons traversing your first toe are pulled in an angle, it may result into worsening of the condition. The major symptom seen is pain. Patients complain of pain with associated redness, soreness, and having a bump in the base of the big toe and are diagnosed with this condition, following radiologic studies. Patients sometimes have a feeling of numbness after a long day’s work. Padding – padding the side that often has contact with the shoes can help you alleviate your symptoms as well. You can check your nearest pharmacy for the availability of one. Icing – As ice has its anti-inflammatory effects, icing your toe a few times in a day can help you relieve the symptoms. Orthotics or night-splints – Although this condition can only be treated surgically, patients still has the liberty to use splints as they prefer. 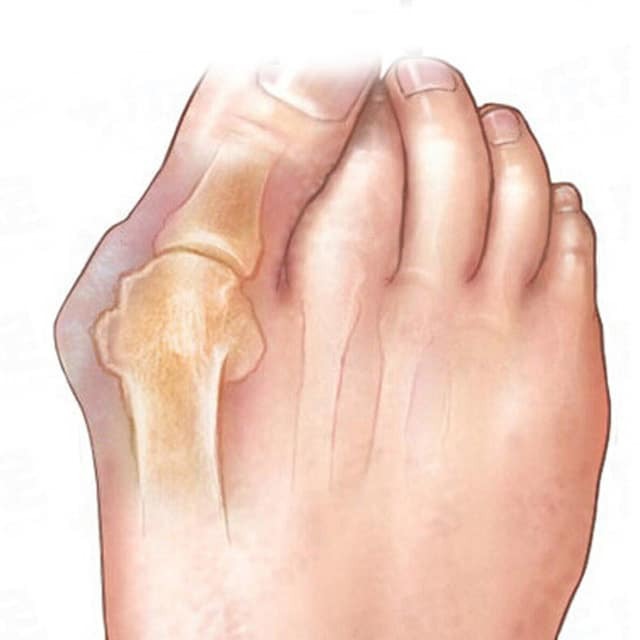 Osteotomy – In this procedure, the orthopedic specialist would then need to break the bone of the 1st toe at the mid foot level, realign, and screw them back together. Syndesmosis Procedure – also called non-bone breaking procedure. With this, bones of your 1st and 2nd toes are tied together (tightrope) to correct the lateral deviation. Right after the procedure, you will be required to use a postop shoe. This shoe is designed to avoid putting any weight at the forefoot as well as to avoid toe flexion. The aim is to avoid weight bearing and avoid any movement of the toes. You may also be advised to use crutches for at least a month following the procedure. Physiotherapy will then be initiated and treatments will be adjusted depending on the progress of bone healing. Regular monitoring is required with x-rays as well. The first few months is critical, especially with the osteotomy procedure, as the bone was cut and it needs a few weeks for it to rebuild again. As the bones of the foot are supporting the whole weight of the body when you stand up, your progress is going to be monitored closely before your orthopedic specialist can decide to allow you to return to full weight bearing with normal shoes. Change of choice of footwear – as pointed-toed shoes make your toes crowd towards the middle as you wear them, it is better that you avoid them if you can. Wearing wider shoes can help your toes relax and by then you can avoid your symptoms such as pain, redness, and swelling.